LOUISVILLE – John H. Glenn, Jr., best known as the first American to orbit the earth, died yesterday at the Ohio State University Wexner Medical Center in Columbus at the age of 95. What is less known about Glenn is his lifelong membership in the Presbyterian Church and the faith that influenced his life’s work. Born July 18, 1921, in Cambridge, Ohio, Glenn was raised in nearby New Concord by his parents John Herschel and Clara, attending Westminster Presbyterian Church with his family. His mother was the first female Ruling Elder ordained in the congregation where his father was also a Ruling Elder. After completing high school, Glenn attended Presbyterian-related Muskingum College (now University) where he studied engineering. Although he did not complete the coursework required for the Bachelor of Science degree, the school granted Glenn an honorary Doctor of Science degree in 1961. Glenn and his high school sweetheart Annie Castor were married at College Drive Presbyterian Church—the church of Annie’s family, also in New Concord—on April 6, 1943. Glenn went on to be a test pilot for the Marine Corps and flew 59 combat missions in World War II. During the Korean War he flew 90 missions, roughly half of them alongside baseball great Ted Williams. Selected as an astronaut by the newly formed NASA in 1959, he manned the first American orbital mission in 1962 aboard the Freedom 7 space capsule, orbiting the earth three times in the nearly five-hour mission. Following his retirement from NASA and the Marine Corps as a colonel, Glenn became a U.S. Senator for the state of Ohio, representing the state from 1974 until 1999. During this time in Washington D.C. he attended National Presbyterian Church, where he served on the Session. In 1998, at the age of 77, Glenn once again returned to space, this time as a payload specialist aboard Space Shuttle Discovery (flight STS-95), which made him the oldest person ever to have flown in space. 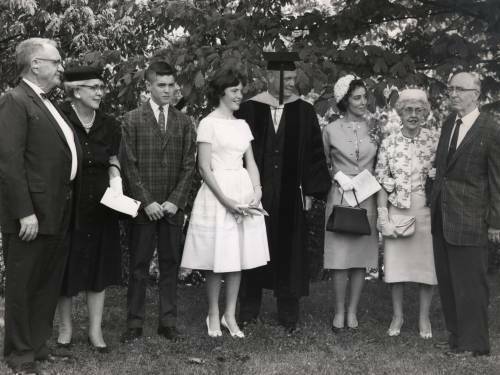 John Glenn receives an honorary doctorate degree in science from Muskingum College in June 1961. 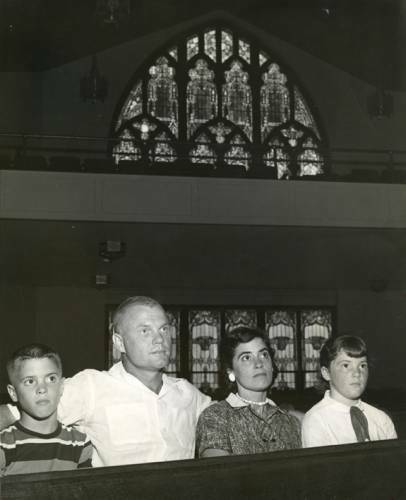 (L to R) John H. Sr. and Clara Glenn; David, Lyn, John and Annie Glenn; and Homer and Margaret Castor. Relying upon his faith, Glenn expressed wonder about creation during his Space Shuttle mission. “Looking at the Earth from this vantage point, looking at this kind of creation and to not believe in God, to me, is impossible. To see (Earth) laid out like that only strengthens my beliefs,” he said. Fellow astronaut and Presbyterian Ruling Elder, Buzz Aldrin, also displayed his faith throughout his NASA career. One of the first things he did upon the first lunar landing mission was to serve himself Communion. “In the one-sixth gravity of the moon, the wine slowly curled and gracefully came up the side of the cup,” he said of the event. In the small town of New Concord (population 2,400), two PC(USA) congregations lay claim to the Glenn family. They would visit each of the congregations—Westminster, where John’s family attended, and College Drive, where Annie’s family attended—during their trips back home. 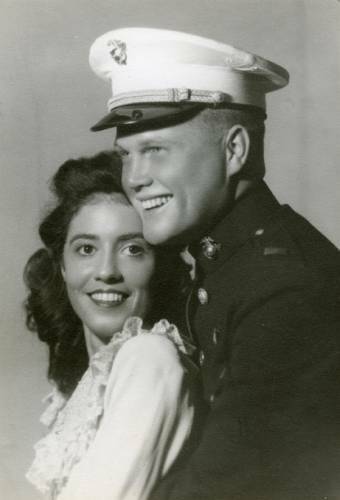 John H. Glenn, Jr. is survived by Annie, his wife of 73 years, their children John David and Carolyn Ann, and two grandchildren. Glenn will be interred at Arlington National Cemetery after lying in state at the Ohio Statehouse and a memorial service at Mershon Auditorium at The Ohio State University.